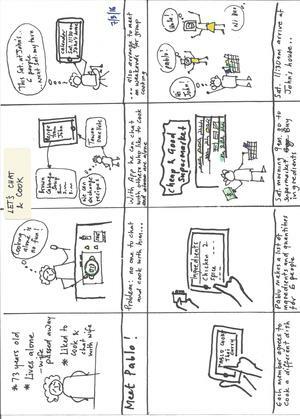 Mapping the context and communicating your concept with a (moving) storyboard. Think of a solution that contains a smartphone or a tablet. Envision the working of the service/product in a storyboard. Upload your storyboard, and a description. Optional: Capture your storyboard in a video and provide it with a voice-over. App that allows people over 60 to chat, exchange recipes and arrange for meet-ups to jointly cook meals for their group lunch or dinner.